You are strolling in a park on a summer day, and you’ve got flowers and birds – and snakes. Indeed, they’re all over the place. 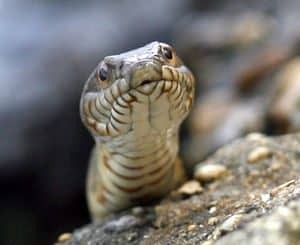 So if you enjoy the company of serpents (and even if you don’t), here are ten things to know about snakes in Virginia. You live with snakes. Unless you inhabit a concrete jungle, you’ve probably got snakes for neighbors. You share space with them when you go on a picnic. You pass them when you hike in the mountains or along the James River. You usually don’t see them because they are shy, and they hide. And let’s face it, you aren’t really looking. Pick your poison? Not here. There are more than 30 types of snakes in Virginia, but only three are venomous: northern copperheads, rattlesnakes and eastern cottonmouths (also known as water moccasins). In the Richmond area, there are no rattlers and virtually no cottonmouths. There are plenty of copperheads, however, to go around. Snakes pose almost no threat to you. About 700 hundred or more people die each year on Virginia’s highways. Snakes kill about two people a decade, health officials say. More people die from lightning strikes. Snakes want nothing to do with you. No snake, not even a venomous one, wants to tangle with a big monster like you. If you come near a snake, it will usually lie stone-still to avoid detection. Its next move is often to flee. Chill out, swimmers. 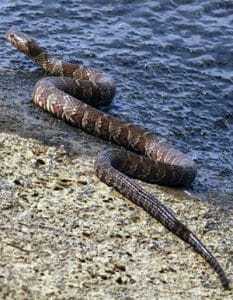 That snake swimming beside you in James River Park is not a venomous water moccasin. Some people think they are protecting the public by killing our swimming serpents, but they might as well be clubbing bunnies: Our legless swimmers are northern water snakes. They are harmless, although they will bite if touched. These water snakes are common across Virginia. You may never see a venomous cottonmouth. The closest ones live in an isolated population near the confluence of the James and Appomattox rivers in the Hopewell area. Others live in swampy areas much farther away in southern and southeastern Virginia. Cottonmouths are more common south of Virginia. But copperheads are common here. They are copper-colored to almost pink, with darker, hourglass-shaped bands. Do an online image search for “northern copperhead,” memorize its appearance, and you can rest assured that any other snake you encounter close to Richmond is harmless. There are no rattlesnakes in central Virginia. The canebrake rattlesnake inhabits swampy southeastern Virginia. Its relative, the timber rattler, lives in the mountains. Both are secretive. Appalachian hikers have surely tromped past timber rattlers without realizing it – and without incident. Snake myths abound. Don’t believe it when you hear that a skier fell into a “nest” of venomous cottonmouths (they don’t “nest” together). And that “moccasin” that supposedly fell into someone’s boat? It was almost surely a harmless water snake (if the tale is true at all – since heavy-bodied cottonmouths aren’t big on climbing). And no, snakes won’t chase you. They will, however, zip past you and even pass between your legs in an effort to get to water or a hiding spot. It is illegal to kill a snake in Virginia. You can dispatch a snake only if it poses a threat to a person or livestock – say, if there’s a copperhead in your garage or a black snake in your chicken coop. Illegally killing a snake is a misdemeanor punishable by a fine of up to $1,000 and six months in jail. So if you are lucky enough to see a snake, put away the hoe and grab your camera. 2016 Copyright© Virginia Wildlife Management & Control.